Models, trends and the atmospheric set-up are look increasingly favorable for accumulating snow across the heart of the Midwest. A band of snow will develop along a line of frontogenesis, or an area where the difference in temperature across two points is increasing. These bands of precipitation can be tough to pin down exact locations, because they can be so narrow and not fully reliant on the track of low pressure. With the said, models are starting to finally agree on the location of such an event. The darker shade of blue is the location currently thought by numerical weather models to have the best chance of moderate snow accumulations. Either way, cold air will funnel in behind the system and bring the coldest temperatures of the season to much of the eastern half of the country by the weekend. A very similar situation set up last November, Post from Last Year, almost a carbon copy! That storm, like many sections of temperature gradient induced snows, trended north with time. This and prior model runs is why we included areas such and Minneapolis to Green Bay in the potential for accumulation. Now the real question, how much are we talking? Well, model runs in recent days have been impressive, but it looks like a general 3-5" with isolated amounts of 6+" where possible banding could set up. 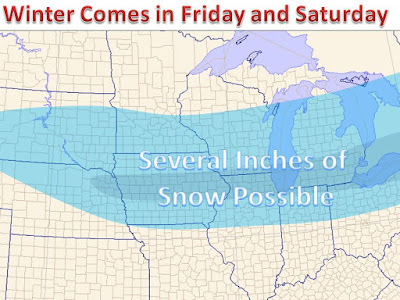 The higher amounts look to develop east of the Mississippi River, lesser amounts west. This will need to be watched closely in the coming days, as we look to pin down the exact location of moderate snow. The pattern looks to kick over to cold and stormy beyond 5 days through the end of the month. You can always watch the snow models come in yourself on our Computer Snow Output page. 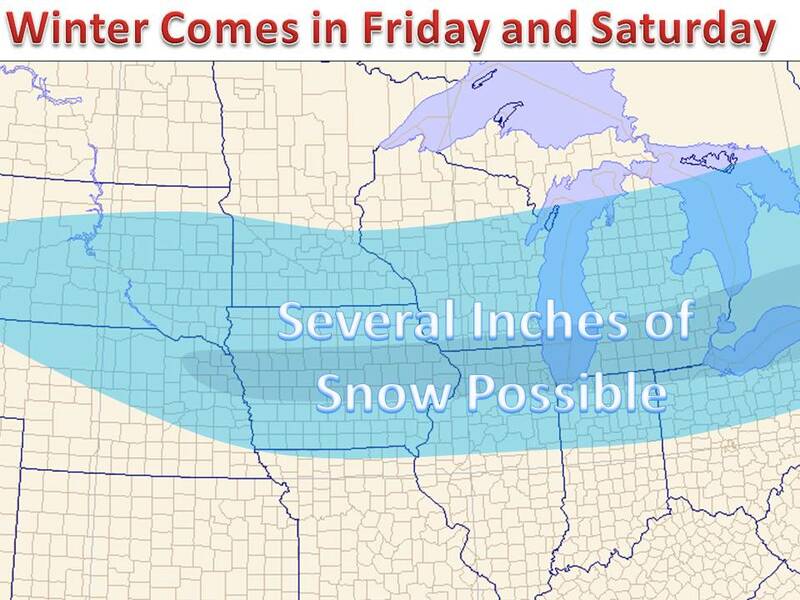 Keep it here for updates throughout the week and our first snow map of the season when the event gets closer.